This 26-inch television is more than just your average bargain set: it's actually one of the cheapest HD Ready screens on the market at this size, and as such, is more than worthy of closer inspection. 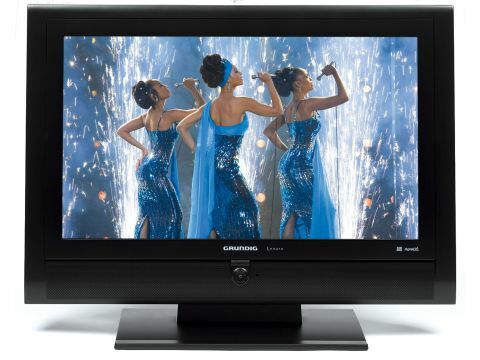 Grundig has obviously decided to throw the minimum amount of features into this television in order to first of all gain HD Ready certification, and thereby appeal to the budget buying crowd. So, we have a 1366 x 768 panel, which is fed via a lone HDMI input. But there's also a Freeview tuner on board, allowing free-to-air TV viewing, but obviously not designed to take advantage of the panel's HD compatibility. The screen is certainly bright enough, although it rather lacks the dynamic range to really cut it with bright whites and deep dark blacks. The darker recesses of the latest live DVD from Nick Cave are shrouded in a grey mist with little in the way of discernable detail. There's also a lot of motion blur resulting in Cave being followed by a trail of disturbed pixels. The picture is also too grainy even with upscaled video, and while this kind of works with the edgy Children of Men, it looks terrible with March of the Penguins. Performance is certainly better with high-definition footage courtesy of the BBC's preview channel on Sky HD, but it still doesn't offer the leap in quality we've come to expect from HD. There's not the extra depth of field and added dimensions that we associate with the best screens when fed this signal. Switching back to the in-built Freeview tuner doesn't help matters either. The bright orange sun that's constantly present in CSI: Miami looks generally washed out and pale on this set, but boosting the colour immediately results in over saturation and lots of unsightly bleed, and it quickly becomes unwatchable. The audio performance doesn't help distract your attention from the picture either; in fact, it's even worse than the visuals. With standard television programmes it's barely adequate with a decent degree of separation of music and dialogue, but turn up the volume with the likes of Lost and it soon falls down. The sound cracks quicker than a perp being questioned in CSI: Miami, and is far too tinny for serious prolonged listening. Okay, so you can partner it with a surround sound system, but who buying a £500 LCD screen is going to make the effort to do that? Not many probably, and this screen needs to stand on its own in terms of sound as well as picture - and sadly, it falls flat. Cheap it may be, but when it comes to value, we demand a little bit more than just an eye-catchingly low price tag. And what it has in affordability, it lacks in quality.